This promo recipe sheet from Pillsbury was found in a large collection, date unknown. I’ve typed it below along with a scanned copy. In mixing bowl, cream butter, frosting mix and almond extract. No need to sift flour; measure by lightly spooning into cup and leveling off. Add chopped fruit, flour, salt; mix well. Shape into 1-inch balls. Place 1 1/2 inches apart on ungreased cookie sheets; flatten. Place 1 teaspoon Frosting on each. Top with pecans. Bake at 300° for 18 to 20 minutes until lightly browned. Fudge Frosting: Melt chocolate in condensed milk over low heat; remove from heat. Add salt, almond extract; blend well. *For use with Pillsbury’s Best Self-Rising Flour, omit salt. 1 cup candied green or red cherries, cut into quarters or 1 cup chopped maraschino cherries or 1 cup miniature gum drops, cut into small pieces may be substituted for candied mixed fruit. Top with a whole or half cherry or whole miniature gum drop. Vanilla extract may be substituted for the almond extract in both cookies and frosting. 1/2 cup raisins may be substituted for the candied mixed fruit. Use 2 teaspoons vanilla; and 1 teaspoon each of coconut and rum flavoring, if desired. I’ve got the same sheet right in front of me–HOW DID YOUR COPY HOLD UP SO WELL??? :-) This has been my family favorite cookie for years, probably since the late 1960s. Unfortunately, I believe they discontinued the frosting mix…or at least they did in the late 1990s. 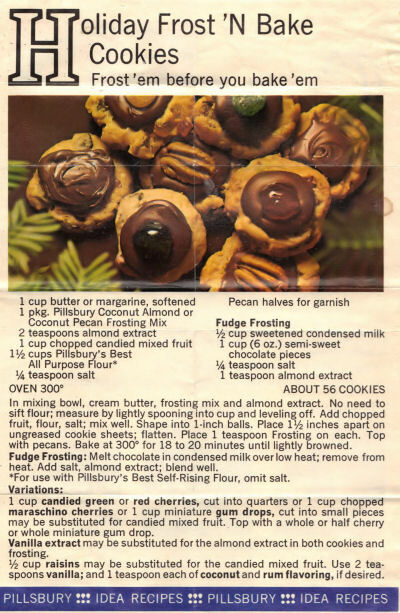 I did contact Pillsbury asking for them to publish a revised recipe using the prepared tub frosting–they told me it wasn’t popular enough recipe to revise. Have you found the dry mix lately? Or have you tried to revise it on your own?